BharataNătyam is one of the oldest dance forms of India. It was nurtured in the temples and courts of southern India since ancient times. Later it was codified and documented as a performing art in the 19th century by four brothers known as the Tanjore Quartet whose musical compositions for dance form the bulk of the BharataNătyam repertoire even today. The art was handed down as a living tradition from generation to generation under the Devadasi system under which women were dedicated to temples to serve the deity as dancers and musicians forming part of the elaborate rituals. These highly talented artists and the male gurus (nattuvanars) were the sole repository of the art until the early 20th century when a renewal of interest in India's cultural heritage prompted the educated elite to discover its beauty. By this time the Devadasis had fallen upon evil days due to lack of state patronage and changed social mores. The revival of BharataNătyam by pioneers such as E Krishna Iyer and Rukmini Devi Arundale brought the dance out of the temple precincts and onto the proscenium stage though it retained its essentially devotional character. Today BharataNătyam is one of the most popular and widely performed dance styles and is practiced by male and female dancers all over India. Due to its wide range of movements and postures and the balanced mélange of the rhythmic and mimetic aspects lends itself well to experimental and fusion choreography. Degree and Post Graduate courses covering the practice and theory of BharataNătyam as well as the languages associated with its development are available at major universities of India. BharataNătyam has its origin in the Natya Shastra, an ancient treatise on the performing arts, and is said to have been written 2000 years ago by Bharata Muni. It was the first book which explained the origin of the art and gave the details about the technique and intricacies of this dance form. The Natya Shastra was created by Brahma on the request of Indra and other devas as an object of diversion for the lower castes (Shudras) that were not entitled to listen to the four Vedas (Sama, Yajur, Rig and Atharva). Brahma created the Natya Shastra as the fifth veda, which was open to all, irrespective of caste and creed. Prior to the creation of the Natya Veda, Brahma entered a yogic trance in which he recalled the four Vedas. He drew the recitative (Literature) from the Rig, songs (Geeta) from the Sama, histrionic representation (Abhinaya, Expressions) from the Yajur and sentiments (Rasa, Aesthetic experience) from the Atharva. These are the four main constituents of the Natya Veda. When Natya Veda was complete, the Gods expressed their inability to practice it and Brahma passed it on to his son Sage Bharata, who passed it on to his 100 sons.Lord Brahma enlightened Bharata Muni with all his knowledge on Dance and Drama, who then compiled it as the Natya Shastra. Shiva learnt the Tandava (masculine) form of the dance, whereas Parvati, his consort learnt the Lasya (feminine) form. Thus the divine art descended from the heavens to Earth. BharataNătyam was performed by Devadasis (slaves of the God) in the temples. These were abandoned girls raised by the priests for their own pleasure and were dedicated to the temple. 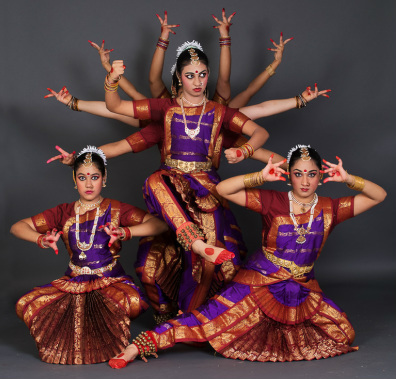 This dance form remained confined to the temple till the 20th century, when dancers like Balasaraswati and Rukmani Devi Arundale brought it out of the temple to the stage and gave it respectability. Thus there is a theory that Bharata Muni laid down the first principles of this dance form and hence it is called BharataNătyam.